Looking for custom t-shirts without having to order a minimum amount? 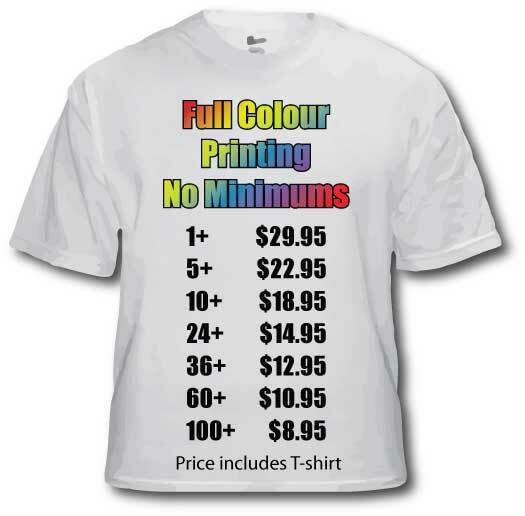 We specialize in high quality custom printed t-shirts with no minimum runs or setup charges. Perfect for birthday gifts, bachelorette/stag parties, fund raising events or even if you want to create a unique t-shirt for yourself. You choose a shirt and send us what you would like printed and it will be ready in 24-48 hours. Images should be high resolution to achieve the best possible print quality. Our printing method is high resolution Direct to Garment which is far superior to heat transferring and can hold up to many washes with little to no fading. We also offer traditional silk screen printing. Click here to design your t-shirt and click on Create Virtual Sample to get started.